Copenhagen, Denmark – 25 March 2019. The University of Exeter, supported by the South West Academic Health Science Network, has partnered with Danish mobile health provider Monsenso in ‘The MOVE Study’ (formerly known as The Klick Project), a research project that aims to review how the Monsenso Solution can be used to support individuals to engage in healthy behaviours that could make a difference to their risk of getting dementia. The Monsenso Solution is a mobile platform, where the individual is prompted with daily self-assessments, weekly clinical scales, while sensor data is collected via the phone. Moreover, it connects the individual and clinician, visualising individual-reported data for both parties and facilitates the possibility of providing patients with relevant information to handle specific challenges that may impact their wellbeing. Both from a societal and a clinical standpoint, the burden of dementia is a growing challenge. The number of people affected by dementia worldwide will reach 75 million people in 2030. In the UK, for example, Dementia UK estimated that approximately 850,000 people were living with dementia. In addition, it was estimated that one in three people born in 2015 will develop dementia in their lifetime. Therefore, new ways of tackling this challenge must be found. 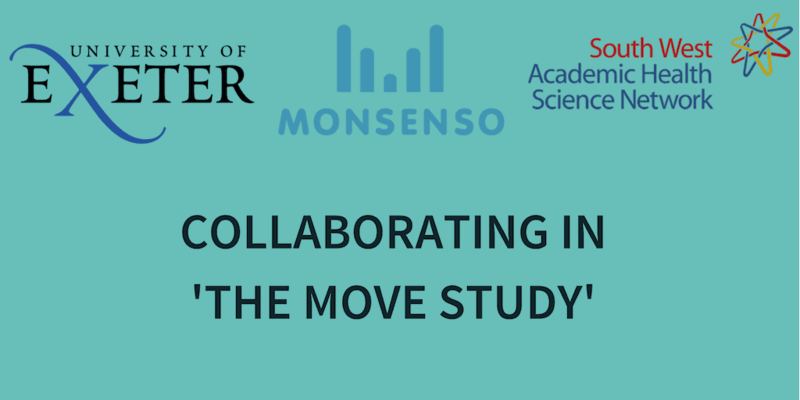 In collaboration with Monsenso, the lead researchers on The MOVE Study – Dr Barbora Silarova and Dr Rachel Collins will set up the solution to support The MOVE Study, and hereafter demonstrate its capabilities for clinicians and patients and receive their feedback. The findings will be used to guide development of future intervention that focuses on changing healthy behaviours that could make a difference to people’s risk of getting dementia. It is planned for the intervention to be delivered in primary care. The configuration of the Monsenso Solution for The MOVE Study will include one of the newest additions to the system; an integration to Withings (wearable technology) which allows for collection of sensor data, such as physical activity, sleep and pulse. University of Exeter combines teaching excellence and high levels of student satisfaction with world class research at their campuses in Devon and Cornwall. They are part of the Russell Group as one of the 24 leading UK universities. Their success is built on a strong partnership with their students and a clear focus on high performance. For more information about dementia research conducted at University of Exeter, please see http://www.exeter.ac.uk/dementia/. The South West Academic Health Science Network (SW AHSN) works to improve the health and patient experience of people in the South West by supporting and accelerating innovation and quality improvement. SW AHSN is part of a national network of 15 AHSNs set up by NHS England, to identify, adopt and disseminate innovative healthcare. As part of KLICK, they will be aiding in the conversation and co-design of solutions to better meet patient needs by bringing together innovators and adopters of new ideas for health and social care. To learn more, visit https://www.swahsn.com/. Dowrick, A., Southern, A. . Dementia 2014: Opportunity for change. 2014 17/10/2018]; Available from: https://www.alzheimers.org.uk/sites/default/files/migrate/downloads/dementia_2014_opportunity_for_change.pdf. Lee, V.S., J. Simpson, and K. Froggatt, A narrative exploration of older people’s transitions into residential care. Aging Ment Health, 2013. 17(1): p. 48-56.